I’ve been super-busy this past week with high school reunion plans… ordering favors, keeping up with ticket sales, writing announcements, straightening out reservations and answering hundreds of questions. I can’t believe it’s been 10 years! I’m also preparing for 4 business trips within the next month and a half… so, God knows that when it’s time to eat, I need easy and quick recipes to use! Fortunately, that’s just what JoVonn of The Givens Chronicles chose for this week’s SMS pick! These were really yummy… especially after I doubled the cinnamon. Perfect for dessert and breakfast the next morning! 🙂 Thanks JoVonn for such a great choice – click on her blog above for the recipe and don’t forget to check out the other SMS bakers here! Position a rack in the center of your oven and preheat to 350 degrees F. Line a standard 12-cup muffin tin with liners (or butter and flour the cups or spray with nonstick vegetable cooking spray). In a large bowl, whisk together the flour, baking powder, salt, 1/2 cup of granulated sugar and 1/2 teaspoon of cinnamon. In a small bowl, combine the remaining cinnamon and sugar. Set both aside. In a medium bowl, whisk together the melted butter, brown sugar and eggs until no lumps remain. Whisk in the heavy cream and milk until combined. Add the zest to the flour mixture and with your hands, gently rub the mixture together, releasing the oils and breaking up the bits. Add the peaches and gently toss with your fingers to combine. Make a well in the center of the bowl. Pour the butter mixture in the center of the well and, using a rubber spatula, gently pull the flour mixture into the center of the well until just combined. Evenly divide the batter among the prepared muffin cups, filling each cup until full and sprinkle with cinnamon sugar. Bake for 30 to 35 minutes, or until lightly golden and a wooden skewer inserted in the center comes out clean. Remove to a wire rack to cool. These look very good! I agree – it’s a very good breakfast choice! Great looking muffins and pics. Thank you for baking with me. Im Glad you enjoyed the muffins! I loved them too. I hope your 10 year class reunion is super fun! 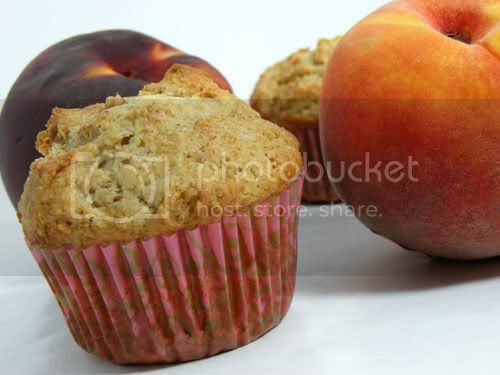 I can’t way I’ve ever heard of peach muffins! They sound really interesting. Also–I don’t know if I’ve ever mentioned how much I LOVE your banner. It is so cute. I need a cool banner for my blog. They look lovely, and I think that the liners you used are adorable. Good luck with your very busy schedule this month! Beautiful muffins! Love your photos. 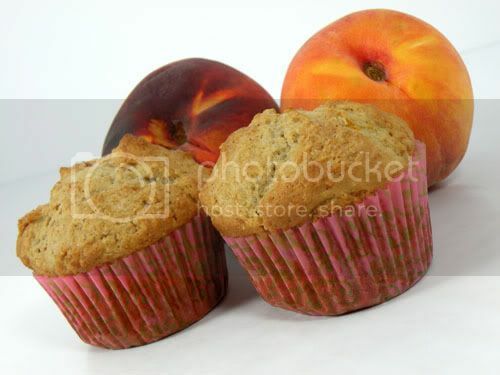 The muffins look great, I love the big peaches in the background! Glad you were able to fit this yummy one in your busy schedule. wow, your muffins look good enough to eat off of my computer screen!! Your muffins look great! So glad you enjoyed them, and that you found the time to make them! 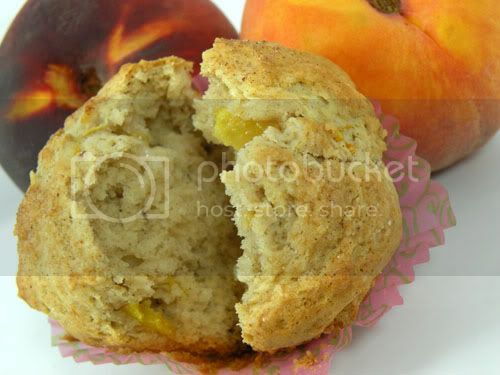 Those muffins look amazing – I hope to try this soon since peaches have been on sale! Your muffins lok picture perfect. They should be the picture to go along with the recipe in the book. Outstanding! Your muffins look amazing! I hope I can find good peaches soon because I’d really like to try these again. Mine turned out a bit dense and didn’t have enough peach flavor, but I think the recipe has potential. Hi Janet! The link I originally posted changed within the last five years, so I’ve updated it and also added the recipe for ease. Hope you love them!